This phone in use project is a simple indicator that you can design and construct that displays the status of the line. If the line is in use, the yellow LED will turn ON. If it is not in use, the green LED will turn ON. By having this indicator, the user will not be interrupted by another user who would want to use the same line. There are altogether 13 electronic parts that are used. They are 4 diodes, 2 LEDs, 5 resistors and 2 NPN transistors. When the telephone is in on-hook condition, the voltage across the tip and ring is in the range of 48V DC to 50V DC. When it is in off-hook condition (the receiver is taken off its hook), the voltage drops to the range of 6V DC to 15V DC. As shown in the circuit, diodes D1, D2, D3 and D4 are used to ensure that in the event that the tip and ring of the line is reversed, the circuit can still be used. When the telephones connected to this line are on-hook, there is enough voltage to turn on transistor Q2 through voltage divider R4 and R5. When Q2 is ON, the green LED L2 will slightly turn ON which indicates that the line is not in use. When the telephone goes to off-hook condition, Q2 will turn OFF. 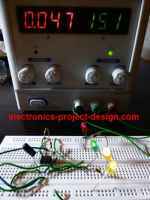 This allows current to flow through transistor Q1 causing yellow LED L1 to turn ON. When it is ringing, both the LEDs will flash.